Join me in October for a cheap, quick, and dirty screenprinting workshop on how to print your own t-shirts. Doing this in collaboration with another project of mine, the Minneapolis pizza club – $5-15. One time only. You can also request to have a shirt printed for you. Workshop: Printing Minneapolis Pizza Club T-shirts with Living Proof Print Collective and Lazy Geometry. Want to learn how to screen-print? 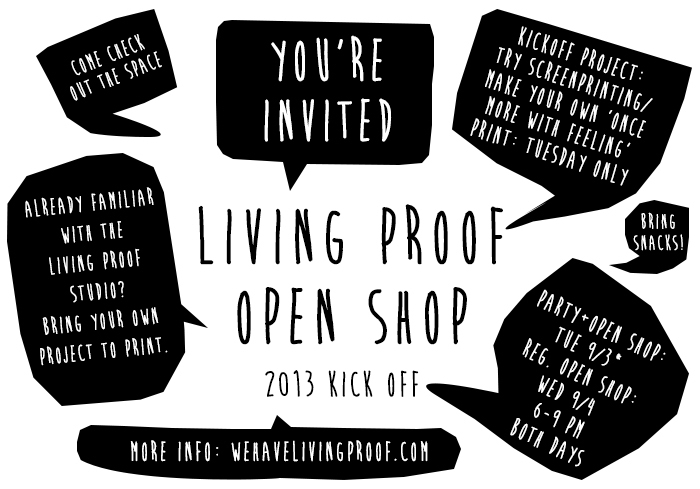 Join Paige Guggemos for a one day only screen-printing workshop in the Living Proof Studio (off Lake & Chicago in Minneapolis – inquire for exact address) where we will learn how to DIY print t-shirts using a design for the Minneapolis Pizza Club – a design which is the shape of Minnesota filled with pizza slices – one color design. Participants will learn how to prepare (add design), coat (with emulsion), burn (expose), and clean a screen. Once the screen is prepared and rinsed, you will get to print your own t-shirt. We will all be sharing 1 or 2-screens to do all of the printing – we do this so we can accommodate more printers in the shop at once.